Last year we hosted a special Point Blank Los Angeles Event Series which saw exclusive masterclasses from the likes of Sweatson Klank, Computo, David Harrow and more. This February we’re back for a Remix & Performance course sampler with David Harrow whose collaborative credits include Lee ‘Scratch’ Perry and Depeche Mode. The free workshop focusses on performing in Ableton Live and is taken directly from the course taught at the school. It’s a great chance to boost your performance skills from one of the masters and you can be sure that much of the content will help in a myriad of other ways, too. So what are you waiting for? You can sign up absolutely free here. All of our instructors at Point Blank LA (and indeed at all of our schools) have a rich history in the music industry, but even among them, David Harrow’s track record stands out. From his beginnings in the post-punk scene in the 80s, he has been present in groundbreaking sounds from New Wave to Neue Deutsche Welle. He dabbled in punk-dub and out-there experimentalism with On-U Sound, San-Fran Disco with giants like Sylvester, Ambient voyaging with The Orb and grubby raves with the king of chuggers Andrew Weatherall. His name even pops up in drum & bass, trance, and west-coast bass music and he landed a pop smash with Billy Ray Martin. Today his output hovers between widescreen soundscapes and percussive soundtracks, but suffice it to say there isn’t much worth knowing that David Harrow hasn’t been involved with in some way. 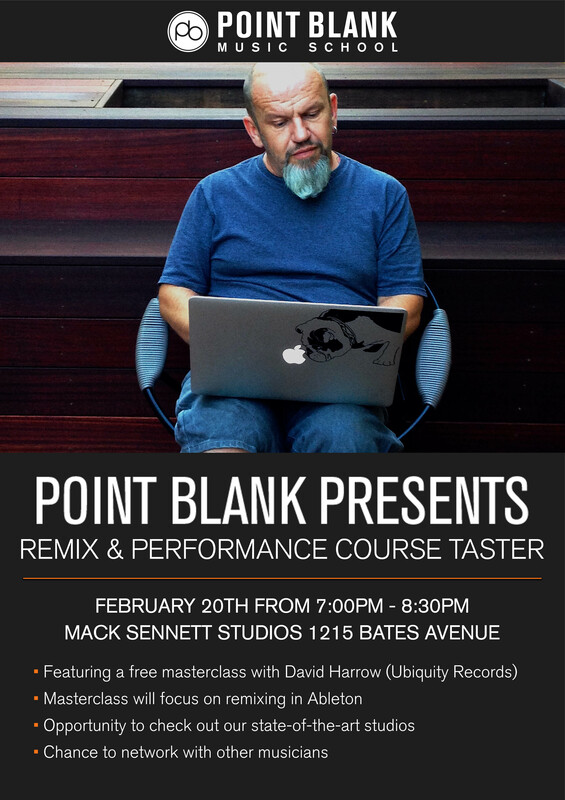 Remix & Performance is just one of the courses on offer at Point Blank LA. Mixing, DJing, Composition, Music Business and more are covered so there’s a course to suit you whatever your need. Any questions call us on 323 282 7660.